It’s been a long time since I wrote a race recap hasn’t it? In fact, until the 4th of July, I hadn’t raced since December. Between wedding planning, getting married and going on a honeymoon, there just wasn’t time to commit to any races. But in between all the madness the Englishman and I have still been running on a consistent basis, so we decided to revisit the Huntington Beach Surf City Run to see if we could beat our times from 2012. 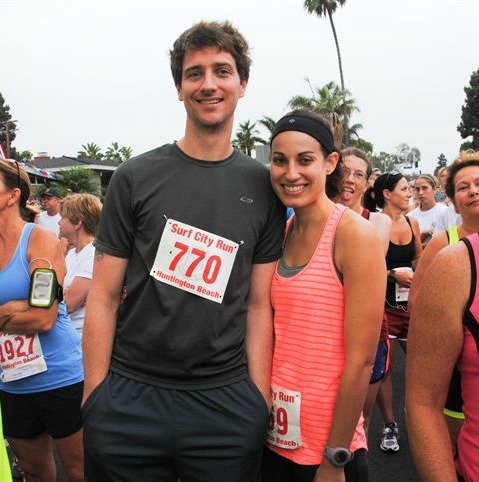 Here is the Surf City Run 5K Recap. I have a complicated history with the Surf City Run. I first ran it in 2011 and crashed and burned two miles in and ended up taking multiple walking breaks throughout. In 2012 the Englishman and I ran it together, but he had only just started running regularly so we took it easy and finished in a respectable 29:30. I skipped out on the race in 2013 and was finally ready to revisit it in 2014. Thanks to crossfit and consistent running, I’ve noticed that my running paces have been getting faster and faster, and began to believe that I could smash my old 5K PR of 28:02. After completing a training run in Maui in 24:00 and a mile time trial in crossfit in 6:54, I began to realize that a fast 5K just might be in the cards. 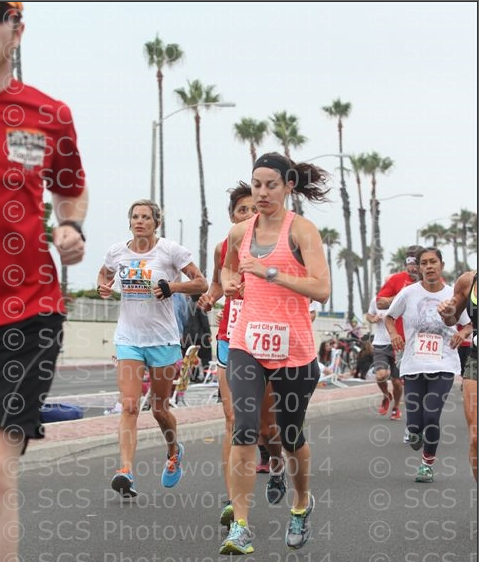 I went into the Surf City Run with no expectations but to come in sub-25. I had been doing longer runs consistently with an 8:00 minute mile average, so I figured a sub-25 was possible. The night before the race I did everything you weren’t supposed to do – had wine, ate different food, and stayed up way too late enjoying the company of my husband and friends. When I woke up in the morning I felt tired but not too bad, so I decided to give the race my all. We even managed to look bright and cheery for a pre-race picture (note the sweet photobomb). We got to the race a little before the start and had time to stretch and use the bathroom. Soon enough we were lining up and the National Anthem started playing. 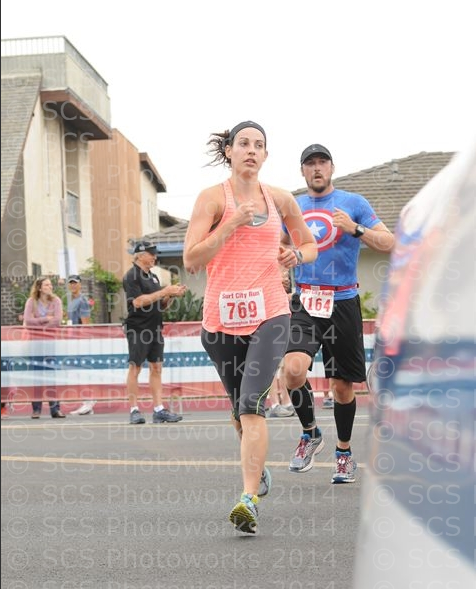 The Englishman and I agreed we would stick together at the start, but since he knew I was gunning for a PR, he told me to just go ahead if I was feeling strong. The horn blared, I started my garmin and we were off. The first mile was pretty congested and I spent a lot of time weaving in and out of people (I need to learn to run the tangents better), but finally I got into a groove and was on my way. After the first mile my watch beeped with a 7:49 pace and I knew a PR just might be in the cards for the day. 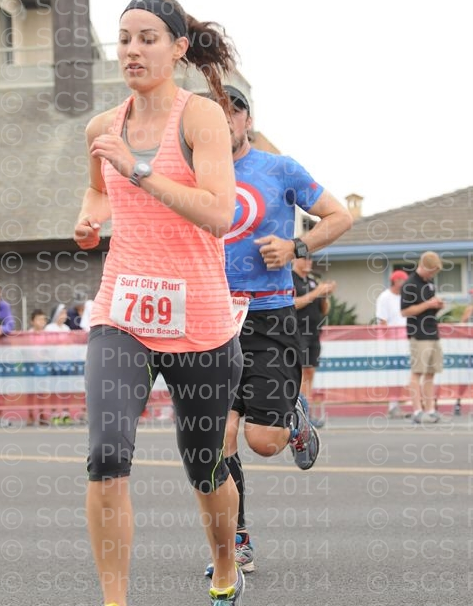 And judging by my face in all these race pictures, I was definitely giving it my all. As we moved into the second mile, my legs were feeling strong and I started to slowly pass people one by one. I’d spot my “rabbit” and work towards them until I could pass them comfortably. My watch beeped again. 7:01. What? I couldn’t believe I was running that fast. The third mile was by far the hardest – the race ends on a small incline so I knew I had to leave a little in the tank to get up the hill at the end. My lungs were burning by this point and I felt like I might throw up but I kept pushing on. Finally, I rounded the curve and saw the finishing mat. I sprinted as best as I could across the line and crossed it in 22:45, a new PR by over 6 minutes. The Englishman wasn’t too far behind, crossing in 24:57 which was also a new PR for him. Both of us were red faced and gasping for air but feeling incredibly proud of our progress in two short years. Racing 5Ks are no joke! 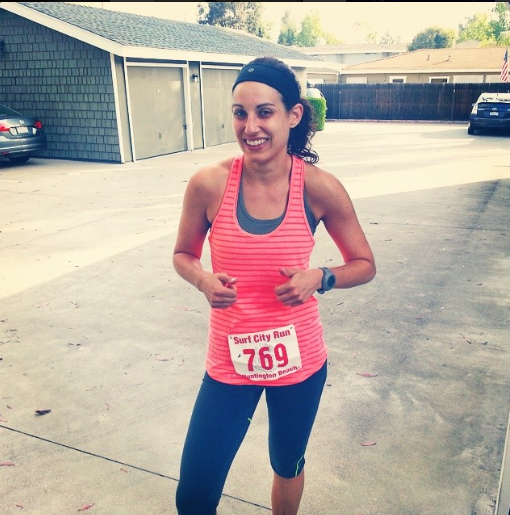 Crossfit – Crossfit for sure has made me a faster runner. Strength training really pays off and I think it’s crucial to becoming a stronger runner. Speedwork – The Englishman and I really started to focus on speed. Sprints during crossfit, running 400s on the track and fast tempo runs. I plan on incorporating a lot of speedwork into my half marathon training plan. This race was the perfect confidence booster I needed as I prepare to dive into half marathon training again. Big Sur Half on Monterey Bay I’m coming for you. Sub-2 or bust! (I get heart palpitations just thinking about it). This entry was posted in Healthy, Life, Running and tagged crossfit, PR, races on July 10, 2014 by allie@sweetpotatobites. I love this race recap! You are amazing! Great job on this race! I want to do a 5k! I haven’t done one in years. You are so speedy! Wow!